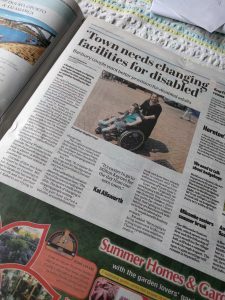 Our article about badly needed Changing Places in Banbury! Author Kat AllsworthPosted on 13th July 2017 19th July 2017 Categories Changing Places, MediaLeave a comment on Look out for us in the Banbury Guardian today! Kat was asked by BBC Radio Oxford to discuss the campaign for a changing place on the David Prever Breakfast Show.